By using the powers of Presence, Curiosity, Awareness & Compassion, we shift from a reactive ego identity to our wise Heart. Together, through experiential work, we replace judgment with compassion, doubt with kindness and fear with joy. Join us April 30th from 2-5:30 pm at the Self & Family Conference in Santa Fe at the El Dorado Hotel. 26th National Conference on the Self & Family in Santa Fe, NM. 4/3 – 5/3, 2012. I present a Lecture/Workshop entitled “Trust your Brilliant Heart” at the El Dorado Hotel Conference 2-5:30 on Monday, 4/30th. Other presenters include: Joan Borysenko, Don Meichenbaum, John Briere & Harriet Lerner, all Ph.D.s. I have been presenting at this conference annually since 2004. 23 CE credits available. Spirit Rock Daylong Retreat, “Freedom through Compassion: Regaining Inner Peace” in SF-Bay Area with Core Teacher Debra Chamberlin-Taylor, 9:30 a.m. – 5 p.m. Sat., Sept. 22nd, 2012. 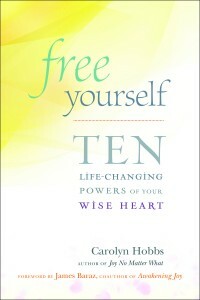 As therapist, writer, teacher, and workshop leader, Carolyn Hobbs has spent over twenty years teaching clients, couples, and students the path to consciousness and joy. With candid humor, deep insight, and loving compassion, she gently guides people through the sometimes scary and overwhelming places of human conditioning to embrace their wise, mature Being Selves. A licensed Marriage and Family Therapist, Hobbs has a Body-Centered Therapy practice in Durango, Colorado. She holds a master’s degree in Humanistic Psychology and has trained intensively with Gay and Kathlyn Hendricks, Ph.D.s, co-authors of Conscious Loving, Conscious Heart, and Lasting Love. She has taught a graduate course in Somatics at Naropa Institute in Boulder, CO, and taught Transpersonal Psychology at Ft. Lewis College in Durango, CO. In addition, she has published articles in Personal Transformation magazine and AHP Perspective (the international journal of the Assn. For Humanistic Psychologists). Hobbs has devoted her adult life to the path of consciousness, focusing on Buddhist studies and meditation, Breathwork, Bioenergetics, Feldenkrais work, dance therapy and body-centered therapies. She lives in southwest Colorado. Feelings are rudders. Like dreams, feelings help guide us through the mystery of life. Yet, to really hear them, we need to unlearn some bad habits. We need to stop judging some as “good” and others as “bad,” and allow all feelings to flow through us, even the scary ones. We need to stop postponing the dark feelings until they make us ill to get our attention. We need to stop losing perspective by getting so caught up in them. It´s easy to make friends with feelings, once we set aside judgment, doubt, and fear. Mind wants to distance us from our feelings by thinking and analyzing the feeling. 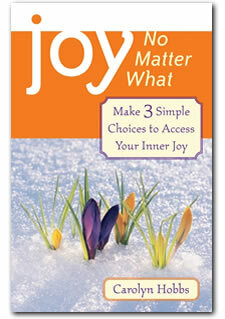 But the quickest way back to joy is to drop down into our bodies and feel it directly. Say “Yes” to what feeling is present, even it makes you uncomfortable. Be curious. Imagine you are feeling disappointment, grief, or loneliness for the first time. Note your habitual reaction to it, then let it go. Welcome your new friend. Notice where you feel it in your body, and its sensations. Ask it, “What are you trying to tell me?” Listen respectfully to each feeling, the way you have always hoped someone would honor you. Honor your feelings. Experiencing each feeling directly, even the dark ones, is gateway to joy. The three basic ingredients for this inner transformation are willingness, curiosity, and courage. These will help you step into a more mature, joy-filled way of relating to life. Willingness is key. Willingness allows your heart, your emotions, your conscious awareness and unconscious fear to align together in the direction of healing. It clears the fog so you can see yourself clearly. Willingness makes it easy to let go of unconscious habits. Whenever a client is about to touch deep anger, sadness or fear, I´m always careful to ask, “Are you willing to heal this issue completely?” You don’t need to know how to make the change, as much as fear demands that you do. Willingness engages the wisdom of your body and heart and, as you will find out, they are trustworthy guides. Curiosity replaces judgment. Rather than judging yourself, inside, for having back pain, feeling sad, or getting sick, curiosity engages your childlike wonder. As you wonder what the sadness is about, your inner wisdom floods your awareness. As you ask, “I wonder how do I typically react to fear, sadness, or disappointment?,” you see without judgment your tendencies to feel anxious, stay busy, or withdraw when upset. Seeing clearly gives you choice. As you shift identities more and more into your Being Self, you allow all feelings to share the same space with love and joy. Courage is required whenever we step into unknown territory. The inner terrain of our unconscious is no exception. Courage helps us see ourselves, and our old habitual reactions, clearly. Ego loves to focus only on our successes, blind to the ways our old habits are hurting ourselves and others. Courage helps us face any pain we’ve been avoiding and move forward into the wise, mature Beings we are inside.